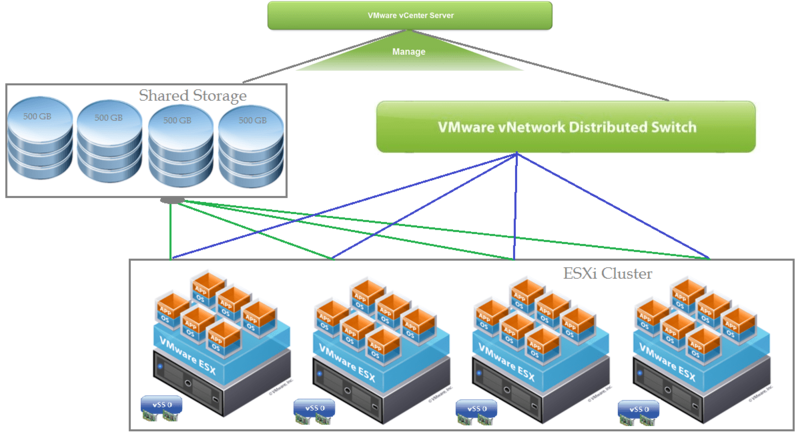 Question: Can you draw on the whiteboard/paper for high level architecture design that details a cluster of 4 ESXi hosts, connected to a vCenter Server that has 150+ VM’s balanced across the hosts.There are 2 network switches vSS-1 & vDS-2 and ESXi servers are connected to for VM & management traffic via VLAN’s .The hosts are connected to four 500 GB shared storage LUN’s that are presented via fiber channel. Answer: If you answer theory questions correctly then Interviewer is going to check your understanding of vSphere Architecture skills. This is tough question as it involves lot of factors to explain specific answer. However I will try to cover my answer with some assumptions to keep it simpler. When I cleared my Data center design exam, there are lot of these examples, we prepared in the Google+ community and shared with other members. There are two phases for any design like Logical & Physical diagrams, where logical talks about high level design but won’t cover any specific product details. Physical diagram will cover most of product specific details like Cisco UCS, storage and software versions. A technical design is a way of communicating an end product or solution. By creating a technical design, a group of people can work together to create a final solution. A design methodology is a multi phase process used to direct a technical design process which involves below steps. Vision: The vision component represents the actual idea. The vision must, therefore, be kept at the forefront throughout the project. Scope: The scope is a quantitative statement of what is included in a project, or, more pertinently, what is not included in a project. Requirements: A requirement is an attribute that must be achieved; Requirements affect design choice substantially. Assumptions: An assumption is something that has been decided to be true for the project design but that has not been tested nor verified. Risks: A risk is an attribute that could prevent the completion of a project or change the project design considerably. NOTE: Each interviewer has their own thoughts for design and he/she may ask you some questions about why you selected this component vs other component [or] product. You need to justify design decisions from the Infrastructure qualities.